Santo Remedio was a startling breath fresh of air. Coming seemingly out of nowhere, that Shoreditch restaurant single-handedly revitalised the state of Mexican food in London with a deftness and depth to its cooking that was true to the mother country and a shining example to the capital’s other Mexican restaurants. That made its sudden closure after only a few months of operation all the more crushing. Corazon, a new and unrelated restaurant in Soho, has already been breathlessly hailed by some as a successor to Santo Remedio. While service was friendly and the diner-like décor soothingly subdued, such overreaching enthusiasm is thus far premature at best. One of the most impressive things about Corazon is the quality of the tortillas they use in their tacos. Thin yet flexible and sturdy, they’re also soft and fluffy with a gentle nuttiness that makes its presence felt without detracting from the fillings. Although all of Corazon’s tacos are somewhat overstuffed, leading to some messy drippage, most people probably won’t see this as a drawback. 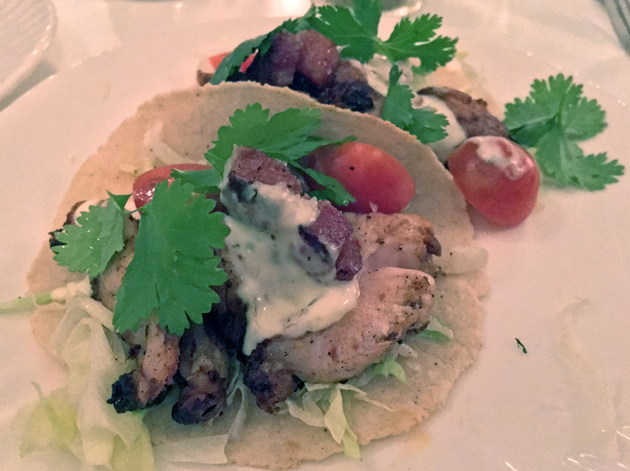 I don’t usually approve of cheating with bacon, especially as the moist and meaty chicken in the BLT Chicken tacos were perfectly respectable in their own right. The smoky, salty and fatty bacon was almost like pancetta and arguably better than the actual pork belly tacos themselves. 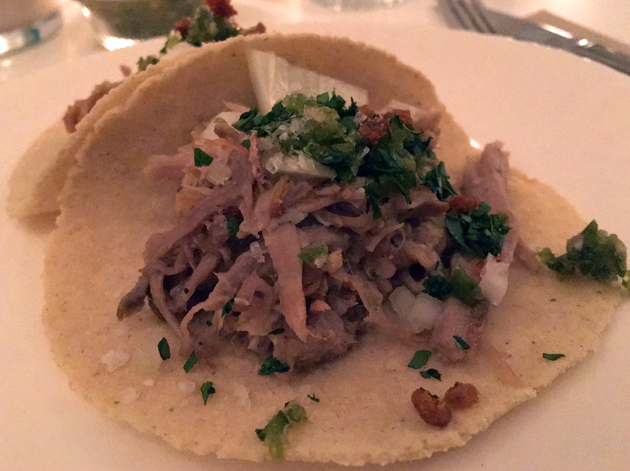 That’s not to say that the pork belly tacos were bad – the swine flesh was dense with a good sense of earthiness and mild milkiness. The porcine shreds were also interspersed with crunchy crackling bits, but the meat was also somewhat dry and lacking in fat too. The taco business has been on the trot recently. A similar problem afflicted the carne asada tacos. The medium rare medallions of steak were lightly chewy with hints of umami, but the beef wasn’t nearly as moist as it should’ve been. This made the creamy avocado and sharp pickled onions very welcome, not only for cutting through the relative umami richness of the beef, but also in counteracting its lack of succulence. The black colour of the tortillas was entirely inconsequential. 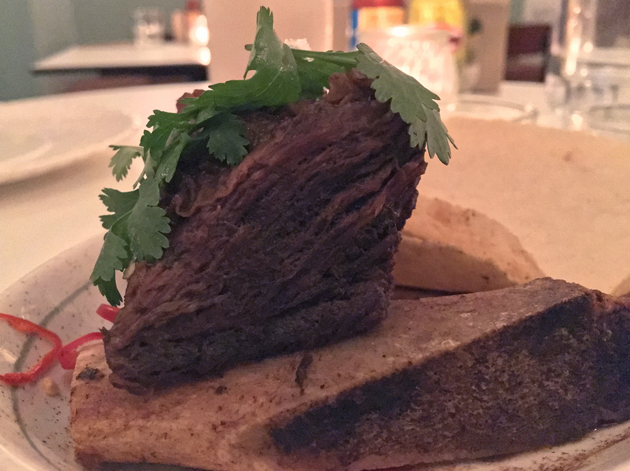 A hunk of beef short rib, served still attached to the bone, was unsurprisingly quite similar to the beef used in the carne asada tacos. It was juicier and more chewy though with a supple rind of gelatinous connective tissue attached for some textural variety. It was a tad small for short rib, but that’s not necessarily a bad thing after a hefty trio of tacos. The beef-to-bone ratio is out of whack. Served with a pair of tortillas. 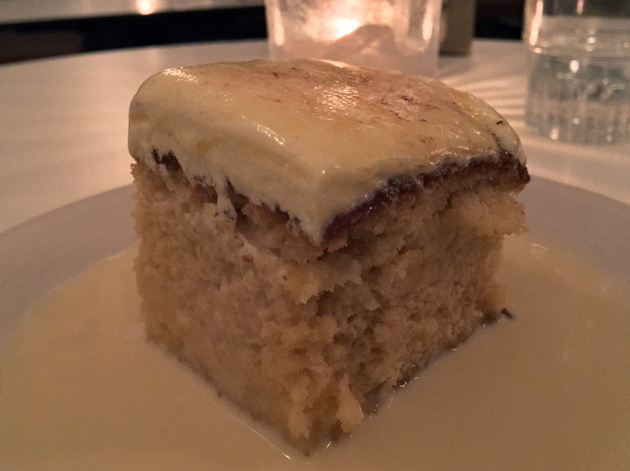 Tres leches cake appeared to be topped with a cream cheese frosting, but it was apparently melted marshmallow instead which would explain its whipped, airy texture. The cake itself was tightly crumbed and very moist, no doubt helped along by the thin yet still intensely sweet condensed milk. It’s the perfect dessert for lifting your spirits. If you think this photo is a bit too yellow, you should’ve seen what it was like before I adjusted it in Photoshop. A surprisingly large number of taco restaurants insist on a mandatory battered fish option. 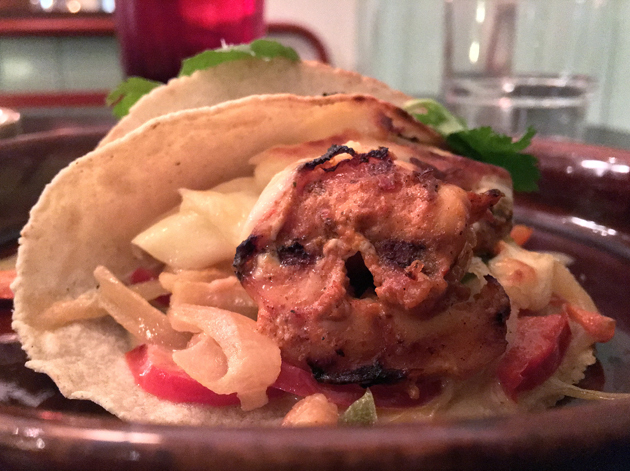 Corazon has wisely avoided this Baja-ish cliché for its pescatarian taco option, opting instead for firm, lightly charred prawns which outshone the unremarkable squid paired with them. Sweet and fleshy sautéed bell peppers and a gooey, lightly salty Oaxacan-style cheese were apt finishing touches on a surprisingly pleasurable pair of tacos. These seafood tacos are called the ‘Guv’nor tacos’ on the menu. If it’d been the ‘Governator tacos’, then I guess it would have been a giant slab of veal schnitzel delivered in a Humvee. 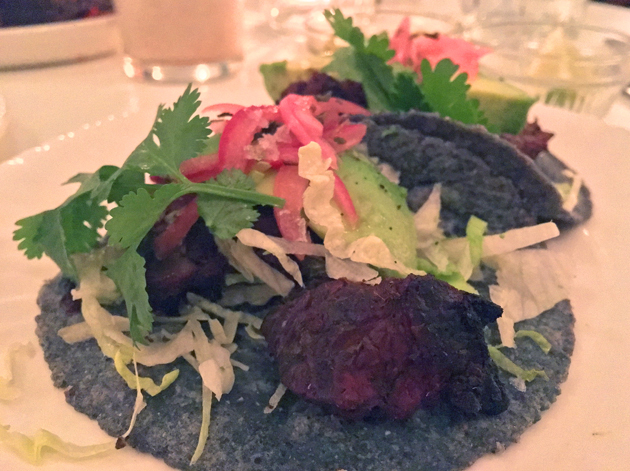 Although Corazon’s lamb tacos weren’t quite as viscerally sensual as the ones I savoured in Mexico’s Chiapas region a year ago, the gently seasoned and lightly gamey shreds of baby sheep were still worth having. 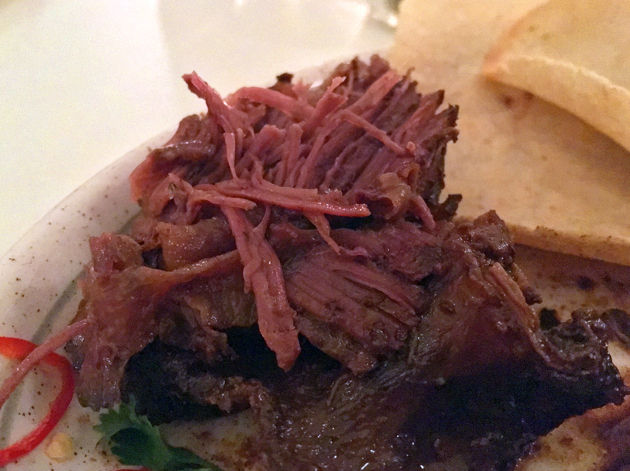 The lamb was also more succulent than the somewhat arid taco meats from my first meal. If you want truly exceptional lamb in Soho, then you need to visit Temper just around the corner. A seafood campachena cocktail starter was like a Virgin Mary cocktail in meal form – the thin and mildly umami tomato sauce had a light piquancy and was judiciously seasoned too. The tame mussels and shrimp left much to be desired though. Cockles and whelks might have been less authentic, but it would’ve made for cheaper and more flavoursome seafood for this starter. 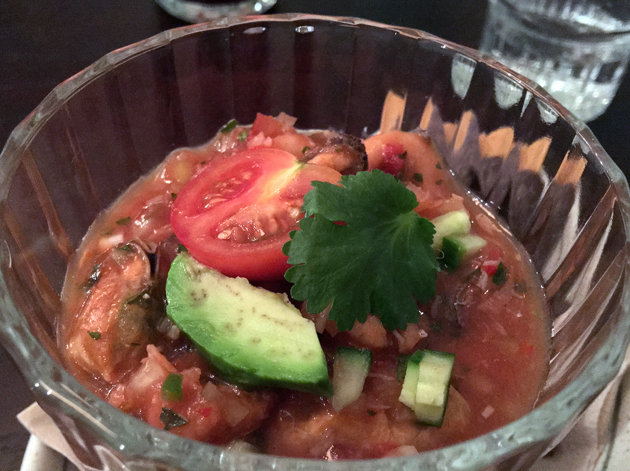 The tortilla chips served alongside this seafood cocktail were several steps above most tortilla chips – light and crisp, avoiding a heavy sense of stale stodginess. If you’re averse to seafood, then you need to reconsider your life choices. We live on an island, for Pete’s sake. 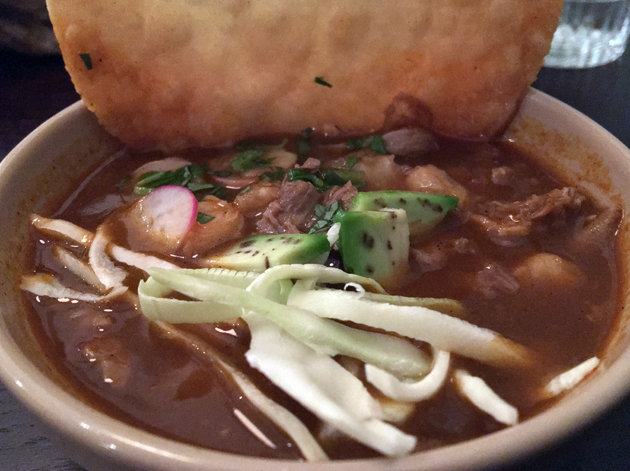 Corazon’s pork shoulder stew is available both small and large portions, with the former more than enough for one person if you’ve already had plenty of tacos beforehand. Although moist and meaty, the star of the show wasn’t the strands of otherwise so-so pork. It was instead the moreish, lightly seasoned broth as well as the big, yielding and nut-like corn kernels bobbing alongside the pork. 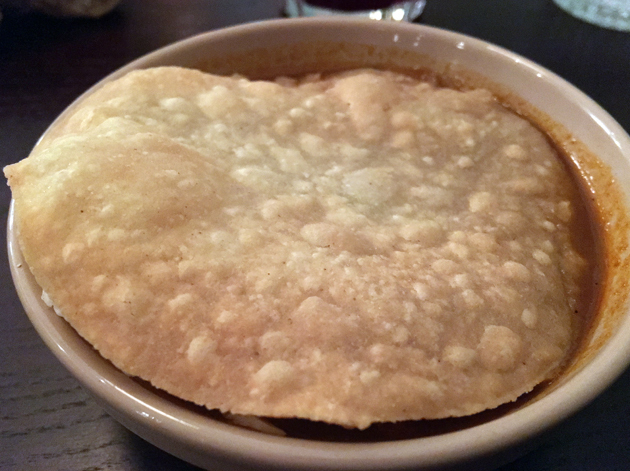 The crunchy and moreish fried tortilla provided for scooping up loose bits of pig and corn shouldn’t be ignored either. A small burden to shoulder. 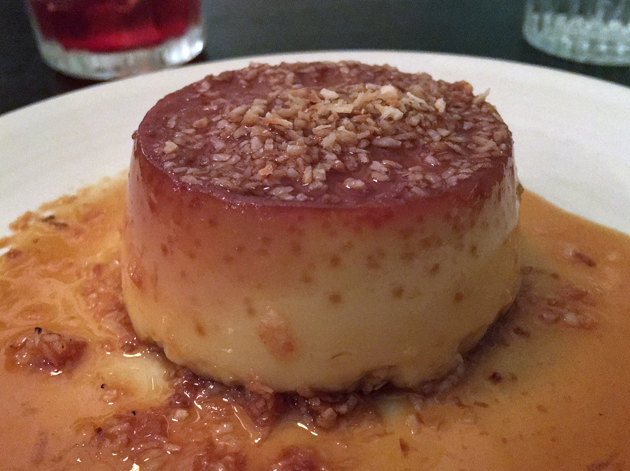 Although the puddle of aniseed-ish syrup was an odd fit for the coconut flan that won’t suit everyone, the flan itself was a joy. A firm and milky crème caramel-style affair topped with crisp coconut shavings showed off the kitchen’s surprising flair for desserts. It’s always a good idea to have a backup flan. 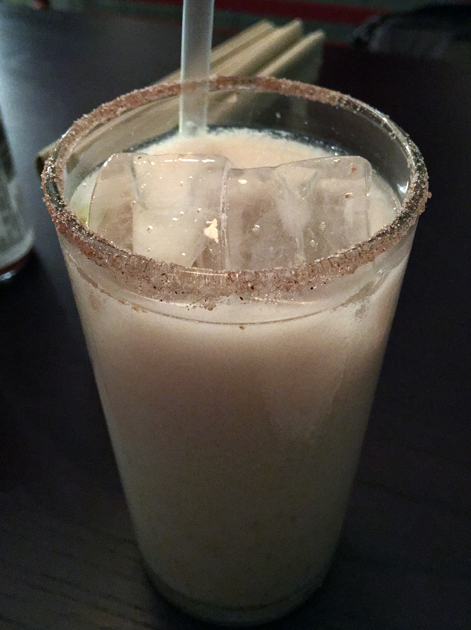 Wash it all down with a milky, chocolatey tasting glass of horchata. The somewhat sour, tangy and cloying taste of the hibiscus iced tea wasn’t to my liking though. Making your own horchata is surprisingly time consuming. Corazon isn’t the new Santo Remedio. Although that Shoreditch restaurant wasn’t perfect, Corazon’s cooking still isn’t as accomplished and full of nuanced depth as Santo Remedio was at its height. There’s little attempt to tackle demanding dishes rarely seen in the UK, such as moles or Veracruzan fish dishes, or tricksy ingredients such as octopus. 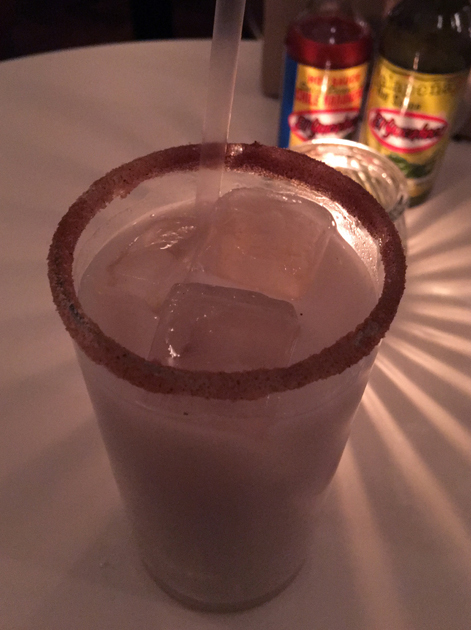 Even so, Corazon is still one of the better Mexican restaurants in Soho and is worth your time and money if you happen to be in the area. 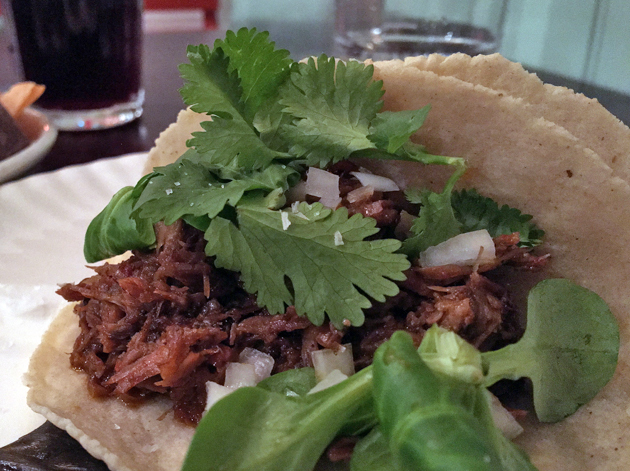 But if you want a far accomplished taste of Mexico, with panache and intensity to spare, then you owe it to yourself to visit Breddos Tacos instead. Opening Hours: Monday-Saturday noon-14.30 and 17.30-23.00; closed Sunday. Tags: bacon, beef, chicken, corazon, creme caramel, horchata, lamb, london, mussels, pork belly, prawns, restaurant, review, short rib, squid, stew, taco, tres leches cake. Bookmark the permalink.